Trigger Warning to those with eating disorders. Today was a wonderful day, but also a really huge wake up call day. I feel sort of self indulgent doing any personal recovery updates lately, but today I’m going to do that. I’m not going to sugar coat it, ever. Recovery can be brutal and I need to document some of those downs. Still I have some positive moments to share! Breakfast. I had a really wonderful, substantial breakfast before work this morning, which is great. 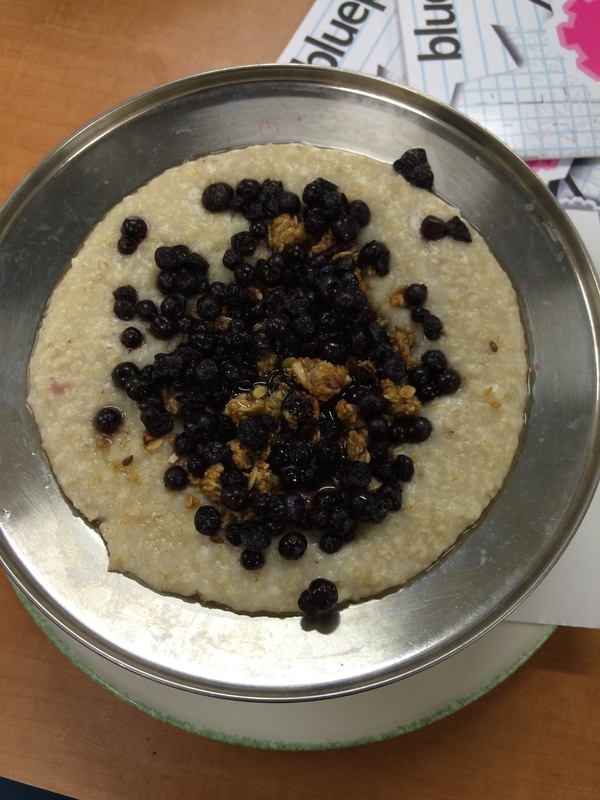 It was organic wheat squares cereal with almond milk, a big glob of peanut butter, a whole banana, and some blueberries. Lunch. I started work at 9, and it was a really slow day! I just worked till 1:30 and ate oatmeal with granola, maple syrup, and blueberries from my work. I used to always get the oatmeal with the syrup and granola, but Ed hasn’t let me for months, so that was a little win for sure. Snack. After my shift, I went to Sammy’s house. She was still at class, so I chilled with her mom and aunt for about an hour before Sam came home. Just seeing this woman makes my life brighter. She is my best friend in every way, and is one of the greatest people. We can always just spend hours doing nothing together and it’s great. Sam knows me way too well, and asked me what I was going to eat before Katrina picked me up for class at 6. I lied and said that I was going to get the free dinner at my seminary, and I think Sam knew that I was lying. Her mom called me to get dinner, and she too is always trying to make sure I’m eating enough. That whole family is my second one. They are such a blessing. Anyway, at Sam’s when I went to the bathroom, I looked in the mirror and felt weird, that I looked different than the last time I looked in the mirror, probably about two weeks ago. I was going to resist the urge to step on her scale but I did, and I’ve dropped weight, too much. It sickens me how much that fed and excited my brain. It was all I could think about all night. What people don’t understand about eating disorders is that I will always be programmed to get a high off of these things; like hunger, and food thoughts, and numbers. It takes WORK to stop that, I’m telling you. So with Kat on the way to school we stopped at Starbucks and I got a soy cappuccino. Dinner. I had my 7-10 Christian Studies class, which was fantastic as always. Got to catch up with my uni girls and learned so much, worked very hard to keep my head away from food. Although I was definitely hungry, and wanted to cry because the hungrier my stomach got, the more my Ed said YES YES YES. An Ed turns hunger into a good thing, and I am FRUSTRATED that after 3 years I still have not gotten normal hunger that actually makes me want food. My illness prevails quite often. 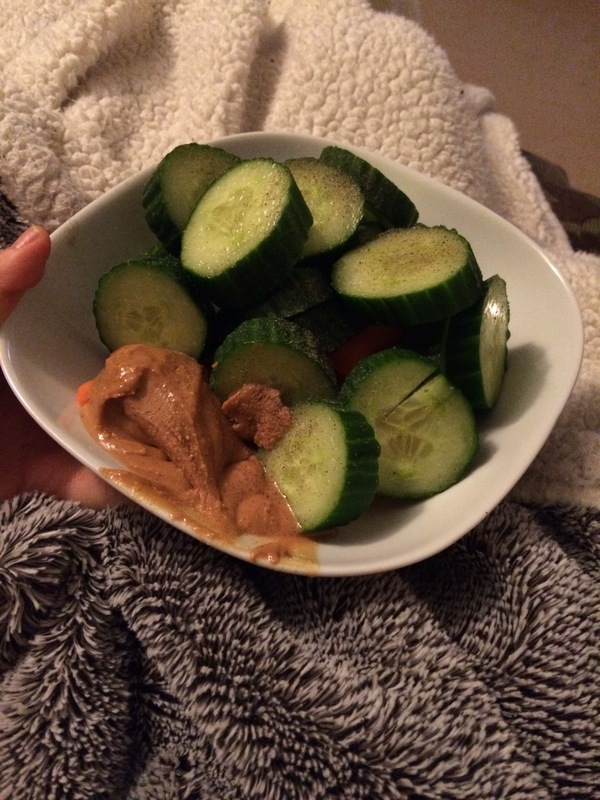 Kat drove me home, where I had a whole cucumber and carrots with a GIANT amount of peanut butter (photo doesn’t do justice) and some turkey slices. You see, I have been in a much better place in recovery. And while this is an alright ish amount of food for a day, it isn’t nearly what it needs to be, nor is it non-disordered. I truly believe that the closer I grow to God and the further I grow in my faith and the more I delve into my need for no pride, I will get healthier and healthier. This was a poor day mentally, but at least I can sort of recognize that. That being said, I do think I need to be strong and reach out for a new type of therapy, I just don’t know what. Hoping to only present you with more and more progress. Sending love everyone’s way.